Information Communications Technology for Development (ICT4D) holds exciting promise, especially on the African continent where we have so many systemic problems that could benefit from different mindsets and new ways of looking for solutions. When I was making my first serious foray into the world of ICT4D in 2012, I first heard about TechChange courses from a friend. When I went to the website, I was very excited to see that they were offering courses that I had been trying to take and hadn’t been able to find anywhere, least of all in Zambia. My plan was to take one course in mHealth: Mobiles for Public Health but the course was so interactive and I learned so much from the course content, online sessions and other learners’ experiences that I ended up taking the following 3 courses in just about as many months! TC103: Tech Tools and Skills for Emergency Management. The result: Zamba U-Report, a SMS-based youth counseling and engagement platform that allows young people to ask trained counselors questions, take part in polls and influence decision making at policy level. Before diving into an ICT4D solution, focus on the problem you’re addressing first and establish if there is a valid need for the solution. Too often, a tremendous amount of resources are wasted when people jump ahead to create a ICT4D solution first and then try to find a problem to wrap around it. In building Zambia U-Report, we first identified the problem as high HIV infection rates among young people in Zambia. Make sure you’re not just building solutions from your desk at an office. The end user of the solution must be involved in the very initial design of the solution, and give feedback throughout the process of prototyping and quality assurance (QA). You would be surprised at how often the community you are trying to help may already know what needs to change to improve their lives. After identifying Zambian youth affected by HIV, we then involved them in designing the U-Report SMS solution and coming up with the key strategic objectives. These young people regularly give feedback and are involved in any further planning or reviews of the programme. The first year of this program’s pilot in 2 provinces has seen 50,000 young people voluntarily sign up and engage the 24/7 trained counselors by asking them questions on HIV, STIs and other sexual reproductive health issues. TechChange courses have enabled me to better articulate and sell the idea of using technology for development to my office and I was able to contribute to various projects including one I am very proud of, the Zambia U-Report (an SMS-based youth engagement and HIV counselling platform). I have since changed jobs from ICT Officer to Innovations/Technology for Development (T4D) Officer. To get the most from these courses, students need to commit the time required to write the blogs, take part in class conversations, read recommended materials, and engage with the instructors and other participants. It is always interesting and there is always something new to be learned from the very diverse group of people you meet in any given TechChange course. Of course, there are more lessons learned in implementing an ICT4D programme and I would like to engage other industry practitioners. Looking forward to taking the Technology for Monitoring and Evaluation course as it will tie in very well with my work with programs helping adolescents and young people! 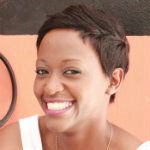 Priscilla Chomba Kinywa is the Innovations and T4D Officer at UNICEF Zambia. She holds a BSc Business Computing, CCNA certification, a post-graduate Diploma in Business Administration and various certifications in using technology tools and skills for international development work including TC105: Mobiles for International Development, TC309: mHealth – Mobiles for Public Health, and TC103: Tech Tools and Skills for Emergency Management. Priscilla has more than 13 years’ experience in ICT, working with WFP for six years and UNICEF for seven. She has also supported the creation of different innovative solutions to challenges that face Zambian children, adolescents and women. Among these are Zambia U-report, a SMS-based youth counselling, engagement and participation platform that has over 58,000 young Zambians signed up; and Programme Mwana, an intervention that uses SMS to reduce the time it takes for HIV test results for infants to reach a mother in rural Zambia from the labs in Lusaka and Ndola. Also see Priscilla’s work highlighted earlier this year on UNICEF here.